This is my first time linking up to HappyDays hosted by Katy (What Katy Said) and Jenna (Tiny Footsteps). 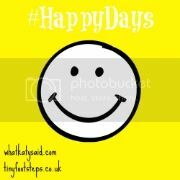 Its a great way to document your week and to also, as the title states, be happy. It's a strange week for me to start as with sickness and rubbish weather it hasn't been the most exciting of weeks but we have still crambed some great things in. And I wanted to find some happy moments in a down week. I was poorly at the start of the week. I have done so well this winter with just the odd cold but on Monday I got the flu. And I have not felt that poorly in a long time. But the hubby and boys did mange to drag me out on Monday for a walk along the canal and a little play at the park before having to take me back home to bed. The only other day we went out was Friday where I took the boys swimming and for a McDonalds lunch with my best friend. With both my husband and I being so poorly and no parents living close we didn't have much fun at the start of the week unfortunately. Then as the week came to an end and my energy levels finally lifted we did lots of tower building with the building blocks and lots of puzzles. I think we have put together every puzzle we have in the house in the past few days. I didn't get to do much of this this week apart from when the boys were in bed I got to snuggle down in bed and read my book that I am really enjoying at the minute. It's by Sheila O'Flanagan's 'If you were me'. But today I am going for a run so will get a hour to myself. My Happiest moment this week was when we were all swimming. We haven't taken the boys swimming for so long and I was a little anxious about how they would be but they loved it. And there were a few times they both sat on the edge of the pool kicking water and giggling to each other, best sound in the world! And the fact Finley then spent the whole afternoon telling me how much fun he had had was just fab. Sorry to hear you have both been poorly! I'm glad that you all enjoyed swimming, Oliver loves to splash the water all over me! Oh no, I'm so sorry that you felt so poorly but I'm glad you're over it now. Sounds like you still managed to have a fairly happy and positive week despite the horrible flu! Thanks so much for joining our #HappyDaysLinky and I hope to see you with us again next week.